President Dmitry Medvedev promises "active, joint steps"
MOSCOW, Russia (CNN) -- Russia said Friday it is ready to help normalize the situation in Afghanistan, where U.S.-led forces are battling the Islamic fundamentalist Taliban for control of the country. 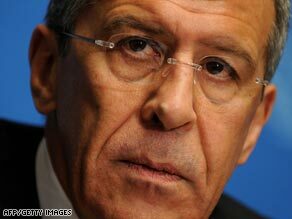 Russian Foreign Minister Sergey Lavrov read the statement promising help from Dmitry Medvedev. Foreign Minister Sergey Lavrov read a message at a conference on Afghanistan from President Dmitry Medvedev in which the Russian leader pledged his support to bring peace to the Asian nation, said the state-run RIA Novosti news agency. "For its part, Russia is ready for active joint steps aimed at normalizing the situation in the country and ensuring its peaceful and creative development," Medvedev was quoted as saying. Speaking about helping to repair Afghanistan's economy, Medvedev said, "In our view, here Afghanistan needs help and support like never before. ... Russia is ready for active, joint steps aimed at stabilizing the situation in this country and securing its peace and progress." The key challenges in Afghanistan are "the fight against terrorism, illicit drug trafficking and transnational crime," Medvedev's message said. The summit was held in Moscow by the Shanghai Cooperation Organization -- a regional security organization consisting of China, Kazakhstan, Kyrgyzstan, Russia, Tajikistan and Uzbekistan. Lavrov will attend a U.N. international conference on Afghanistan in The Hague on Tuesday, the Russian Foreign Ministry said. "The minister will outline the main results of the conference on Afghanistan in Moscow," the ministry said, according to RIA Novosti. Secretary of State Hillary Clinton will represent the United States at the United Nations meeting. A Chinese official said at Friday's conference in Moscow that China will give $75 million in non-repayable financial aid to Afghanistan over the next five years, the Interfax news agency reported. "To date, China has given over $180 million to Afghanistan and has completely written off its debts," said Chinese Deputy Foreign Minister Sung Tao. The conference was held on the same day that U.S. President Barack Obama announced a "comprehensive" new strategy for the growing threat in Afghanistan and Pakistan. Obama's plan calls for putting 4,000 more U.S. troops in Afghanistan, passing legislation that would help the economies in Pakistan and Afghanistan, providing more training to bolster Afghan security forces and increasing civilian expertise to help develop Afghanistan's economic, social and governmental institutions. Russia has a history of involvement in Afghanistan. It invaded the country in December 1979 and got bogged down in a bloody and costly guerrilla war with mujahedeen fighters. Russia started withdrawing its troops in May 1988 and the last soldier left in February 1989.